Well….winter has been miserable this year in the cold frozen tundra (yes a GB Packer fan) of Bangor. The temps haven’t been so low consistently, but have been on a complete roller coaster from 20 below to 40 above within 3-5 days. There has been a dirth of snow, but sheets of ice, which has made outdoor work virtually impossible all winter. At least we have an indoor ring even though it is relatively small and our track ponies don’t much like being confined to work, we have been able to keep some form of work going up here and that is yards ahead of what a lot of riders have faced this year. Shu (aka Muchu) and Patrick have settled in together beyond my wildest dreams. At this point in time Shu has been off the track only 8 months and my son has only been riding the same 8 months, yet they are seamless in their bond. There have been periods when the girls have not been able to go out for a week at a time due to weather, and despite pent up energy, Shu always takes care of him the minute he puts his foot in the stirrup. She can’t depend on him to always provide her what an experienced rider could, giving her reassurance and guidance, so when it calls for it, she looks after him. All of this and Shu is still only a baby herself, not even four yet. I have to honestly say that while I had expectations of working with a very good horse, as you should expect from the breeding, she has never ever failed to exceed my dreams immeasurably. She has looked after him through difficult and miserable circumstances with the class and aplomb of a seasoned school horse, but done it with the grace and athleticism of a potential competition horse to be reckoned with at some point. 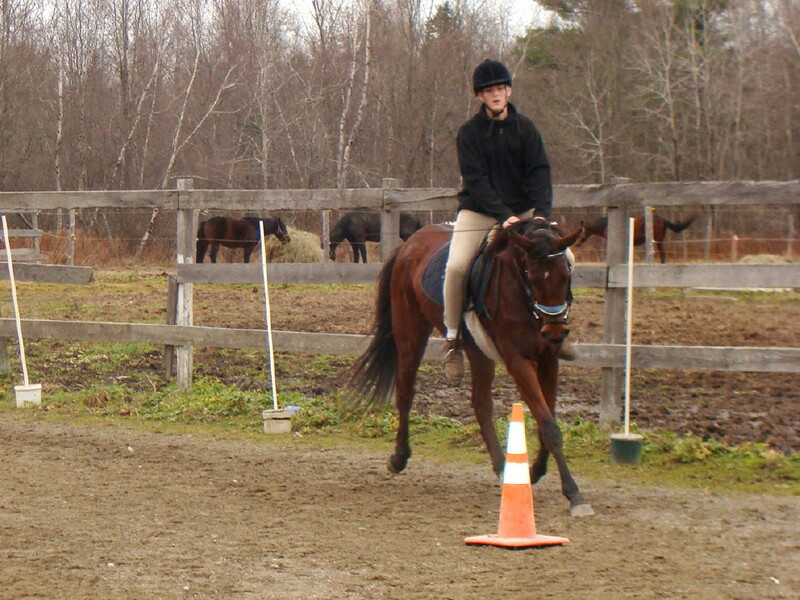 I am sooooo looking forward to spring now, when we can really begin to push the envelope and see what she is really capable of, as well as just plain ole have fun riding, instead of having to balance a polar bear’s worth of clothing on the very mobile back of a horse. I would send pictures, but you couldn’t tell there was actually a human on the horse…..and……I even hear there is a rumor of another one of Elizabeths horses making an appearance up here soon from people having seen Shu and liking her so well……hmmmm……how many of Elizabeth’s horses do we have to have here to get a franchise designation?….Bits and Bytes North…….think about it E—it has a ring…..
Chuck is correct. 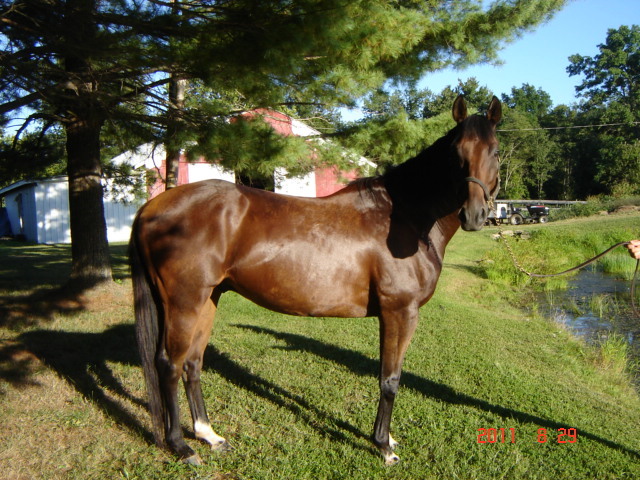 A third Bits & Bytes Farm Prospect Horse will soon be on his way to Maine. Jill Schnedler, the owner of the boarding facility where Chuck and Patrick board will soon be getting her own Thoroughbred! Jill has purchased Sir Leonidas aka our favorite horse “Leon”. 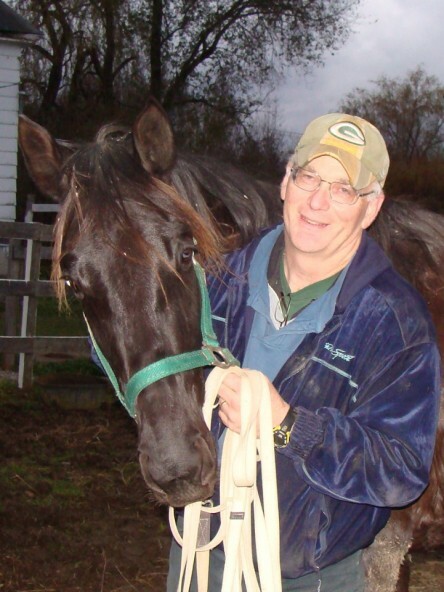 Chuck purchased Great Game for himself after his son Patrick bonded with Muchu and left Chuck wondering what he would ride.